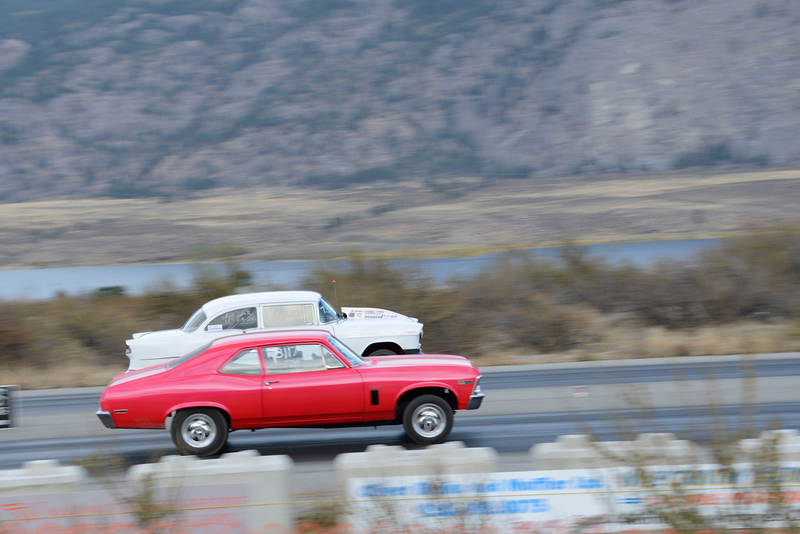 The Wine Country Racing Association (WCRA) had their final drag racing event of the 2016 season yesterday at Richter Pass Motorplex. It was a time for one last kick at the can before all of the vehicles are tucked away, and Old Man Winter makes an appearance in the South Okanagan Valley. What a kick it was. More than 60 drivers and a nice showing of fans turned out on the Thanksgiving weekend to have some fun with friends and family. Track regular, Phil Walter and his 1986 Nissan truck made his way down the valley with a nice surprise under his hood for everyone. 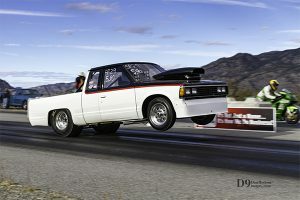 The black and white truck delighted everyone in attendance with its new high-wheeled launches from the starting line. Jason Kirton from Penticton (1982 Chevrolet S-10) beat Penticton’s Bryce Russell (1994 Lincoln Marquis) to the winners’ circle. 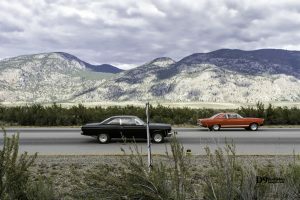 Paul Fode (1970 Plymouth Cuda) from Kelowna, BC fell to Gary Conto (1967 Camaro). Conto brought his ride from Westbank, BC to take home the prize. Wheel-standing Phil Walter (1986 Nissan truck) from Peachland, BC zipped away with the Super Pro trophy, besting Levi Weiberg from Grand Forks, BC (1981 Buick ). Penticton, BC’s Steve Clement (2003 Arctic Cat) beat out Oliver, BC’s Warren Brown (2002 Kawasaki). Phil Walter (1986 Nissan truck) was on his game this weekend. An absolutely PERFECT reaction time of .500 is just one more bit of proof. Brad Quwek from Bruderheim, AB (1973 Astra) was awarded the Sportsman of the Year Trophy. Brad is a gentleman that is always ready to lend a hand or offer up strong competition. His kind manner and easy smile are a pleasure for everyone that meets him. A big thank you goes out to the club, racers, volunteers, sponsors and fans for a fantastic racing season. Ending on a high makes it harder to wait until spring for the next event. 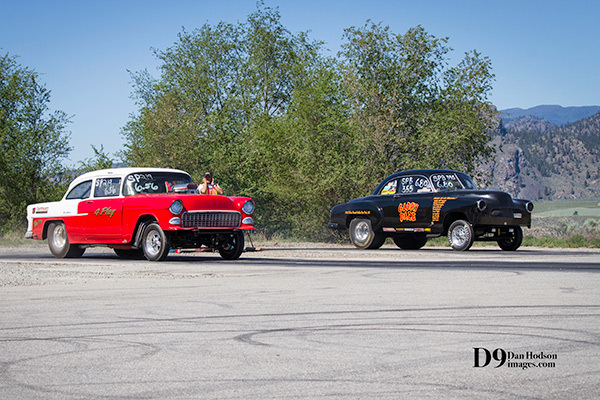 Steve Lachner brought his 1955 Chevy Belair from Kelowna, BC to line up against Oroville, WA’s Ernie Bartelson in his 1955 Chevy 2-door at Richter Pass Motorplex last weekend in Osoyoos, BC. The first day of the 2016 drag racing season is now in the record books, where it belongs. The Wine Country Racing Association (WCRA) put on the show to a crowd of fans like no season-opener has ever seen. More than 61 drivers flocked to the track from all over British Columbia and Washington state. Pro Bracket: Paul Fode (Kelowna, BC) raced his 1970 Plymouth Cuda past Chip Sabyan (Oliver, BC) in his 1984 Olds Cutless. Super Pro: Brad Baxendale (Osoyoos, BC) and his 1969 Beaumont zipped by Kayle Shaw (Penticton, BC) and his 1972 Chevy Vega. Bike/Sled: Art Raymond (Grand Forks, BC) took the first place trophy on his 2001 Suzuki Katana by beating out Chase Cranna (Kamloops, BC) and his 2003 Suzuki. 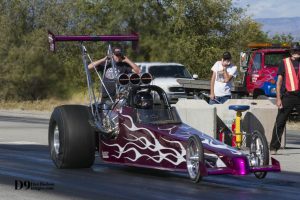 The spring segment of drag racing will continue at RPM with back-to-back weekends May 29 and June 5. The gates will open at 9 a.m. Racing will begin at 10 a.m. Final elimination rounds will start at 1 p.m. 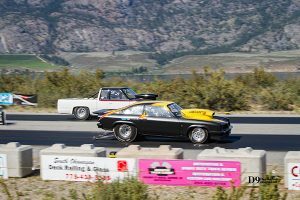 This past weekend the Osoyoos airport was transformed by the volunteers of Wine Country Racing Association (WCRA) into Richter Pass Motorplex. The valley-wide Car Club Challenge saw its sixth year draw in four car clubs, 94 drivers and over 600 fans. The Kelowna Kustoms, the Okanagan Rodtiques and Oliver’s Coachmasters welcomed the Cam Jammers from Vernon into the mix-up on Sunday. Oliver’s Cliff Meeds was able to even up the score for the Coachmasters. The Kustoms, Rodtiques and Coachmasters all boast two wins. I’m sure next year the Cam Jammers will be back to see what kind of upset they can cause in the ratings. Meeds snatched the trophy and prize money in his 1949 Ford pick-up to victory over Kelowna Kustoms’ Darren Williams’ 1937 Buick coupe. The winner of the “Fast Eight” challenge among the car club members is Reg Krutom. Krutom and his 1958 Yeoman station wagon take a cool hundred bucks back home to Kelowna. 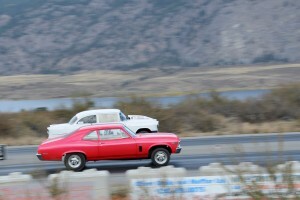 The Rumble in the Valley is always a delight to fans and racers alike.